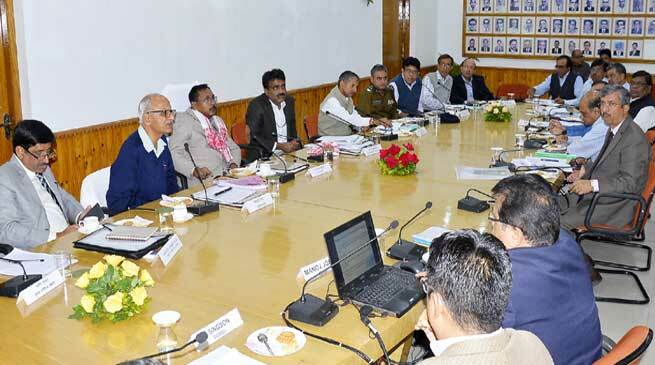 Minister of State for Railways, Mr Rajen Gohain stressed on timely completion of all railway projects under Northeast Frontier Railway for optimum utilisation of resources. He was addressing a review meeting held at N. F. Railway Headquarters in Maligaon this afternoon where General Manager of N. F. Railway Mr Chahatey Ram, General Manager of N. F. Railway (Construction) Mr H. K. Jaggi and other senior officers were present. Gohain said, safety of passengers and security of railway assets should be given prime importance and added that railway should take all possible steps for maintaining cleanliness. He also interacted with Divisional Railway Managers of five divisions of N. F. Railway through video conference and emphasized on the above aspects. The Minister directed the railway officers to ensure adequate cleanliness of stations including Guwahati station which is considered gateway to the Northeast and also asked for optimise working of mechanised laundry. He also called upon railway officers to explore innovative strategy for better utilisation of luggage / parcel vans attached with passenger trains. For improving freight revenue Railway should try to gauge industry’s need for tapping new segment of freight, he said. He asked the General Manager to devise plans for development of tourism in Northeast in association with state governments so that the railway can play constructive role in realizing the full potential of region’s tourism industry.